We've all had one of those days. You know, the ones where you got up late because you couldn't sleep last night, you're horrendously behind schedule for work, the phone's ringing off the hook with calls from your boss who already hates you, your car has broken down, your kid is off school sick, and you feel like no one on earth has experienced stress quite like this. You're certainly not the only one to feel this way, but despite what you may think, there is a solution to your problem. And, yes, it's one that doesn't mean walking around your office with a pained smile that tells your co-workers that "everything's fine", while you secretly scream inside. Allow us to introduce you to TouchPoints, the wearable stress relief devices which could be the answer to nearly your every worry. Founded in 2015, TouchPoints alleviate stress through neuroscience and technology, working by sending vibrations that disengage the body’s instinctive 'fight or flight' response to stressful situations. Using patent-pending technology called BLAST, they offer a discreet and non-invasive method to remedy taxing moments in life. When a person is feeling pressured - whether this be through a big presentation coming up at work, an unpleasant conversation that needs to be had with a manager, a desperate need for sleep, or whatever else - TouchPoints shifts the individual back into thinking with the logical, rational part of their brain, incredibly making their stress seem manageable. If you're looking for results, look no further than this impressive statistic: TouchPoints users have reported a 71 percent reduction in body sensations within 30 seconds. Perhaps the revolutionary device has been so successful because it comes from a very personal place for its creators. Co-founder and CEO of The TouchPoint Solution, Vicki Mayo, spent countless sleepless nights watching her daughter experience vivid night terrors before reaching out to her friend Dr. Amy Serin for help. "It was horrible. I felt helpless, like there was nothing I could do for her," Vicki said. "The whole family was suffering because she would wake up nightly and we’d all be awake. The following mornings we would be exhausted - we were caught in a spiral I couldn’t get out of. I felt like I had tried everything, and we were at our wit's end." Having isolated a component of successful PTSD treatment, neuropsychologist Dr. Serin was using it to research the impact of stress-reduction using a handheld device on children, and soon suggested that Vicki's daughter try her product. The treatment provided fantastic results and soon enough, Vicki and Dr. Serin decided to team up to create an instant stress-reduction solution that could help out individuals all across the globe who were grappling with stressful workloads. Since then, the company has soared, with many of its users unable to praise it enough. Take TouchPoints user Wanda Gibson's husband, for example. After he was deployed nine years ago, he returned a "different man", who was often angry, impatient and depressed, and was soon diagnosed with PTSD. After testing different methods of recovery, including counseling and medication, Wanda feared she would never have any resemblance of her old husband back. Until she discovered TouchPoints. "I convinced him to try the sleep setting and the first night he slept better than he had in years!" said Wanda. "We are now three months out from the purchase. My sweet, gentle, kind husband has returned. He’s used them almost daily since then and I have no doubt that he has built new neuropathways which has helped him cope with the daily stresses that he encounters. He feels a million times better and is now equipped to deal with difficult situations with hope." Wanda and her husband have joined thousands of others raving about TouchPoints - and you could be next. Next time you find that pained grimace emerging on your face in the office, you know what to do. *This article first appeared in Viral Thread on July 30, 2018, by Emma Brazell. To read the full article, click here. Last year we introduced to our readers ReliefBand. ReliefBand uses proprietary programmed pulses to send a signal to relieve nausea. It really works and I don’t travel on boats/ships without it. Today we’d like to introduce TouchPoints to you. TouchPoints is a similar device in the sense that it uses using neuroscientific technology, involving electrical pulses, to relieve stress by over 70% in as little as 30 seconds. Wow, is that even possible? Yes, it is, we tested it. In fact, I wore the TouchPoints bracelets during the Consumer Electronics Show in January. Why? With over 4,000 exhibits to see and 185,000 people, let alone all of that exciting technology and accessories, your blood tends to pump a little. I used TouchPoints to help settle me. Did it work? Can TouchPoints Really Reduce Stress in Minutes? Yes. I felt calmer. But to drive the point further, when I stopped by the TouchPoints booth at CES (when I wasn’t wearing them), they had me sit down and they took my blood pressure. My blood pressure was 131/99 with a heart rate of 66. My blood pressure is usually 120/78 and my heart rate is normally 65. I then put on my TouchPoint bracelets for several minutes and my blood pressure went to 121/88 and my heart rate slowed to 64 beats per minute. Now mind you, all the chaos was still going on around me – thousands of people around, loud talking, people in the TouchPoints booth asking questions, waiting for their turn to have their blood pressure read. An interview was going on in the booth, showing TouchPoints to TV show videographers. Things were happening, yet I was getting calmer. The CES Show is no place for peaceful blue skies, chirping birds, a placid lake, or other calming cues. So to be in the midst of chaos and obtain a state of calm is near impossible. But it is possible with TouchPoints. TouchPoints are sold with two bracelets that you slip on each of your wrists. You need two of them to tag team each other and work throughout your body. Although I should note, that they do not need to be on your wrists. You can also clip them to your clothing or keep them in your hands, they just need to be on opposite sides of your body. Or you can customize your own sensations by altering the Frequency, Intensity, and Overlap of the alternating pulses and even create your own favorite settings (up to 3). As you could see from my blood pressure results above, TouchPoints have an almost immediate way to reduce your body’s response to stress. In fact, case studies conducted by TouchPoints that people using TouchPoints with generalized stress showed a 90% reduction in headaches while increasing the quantity and quality of their sleep. They also improved their productivity. There are over 6 million children diagnosed with ADHD in the United States. Although TouchPoints cannot make ADHD disappear, they can do a remarkable job in helping children (and adults) focus and reduce their normal activity impulses. Does your child have trouble completing simple tasks in the morning to get to school? How about focusing on tasks? Can s/he stay in his/her seat during school? TouchPoints can help. In this ADHD case study, a 14-year old boy wore TouchPoints in the morning for a 1/2 hour while getting ready for school and things became much easier…for him and his exhausted mom. She couldn’t believe the difference. Her son also wears them in school to help him stay in his seat. Oh, and the average hours of homework he used to spend were reduced by an hour a day. Does your child or a child you know have autism? One in 68 people is diagnosed with Autism. Typically, a child with autism can be obsessive, hyperactive, irritable, angry, reactive, has little eye contact with others, and can refuse to do their work. That was the case with the 10-year-old boy in this Autism case study. In fact, his teacher was so impressed with the difference that she requested that the school has extra TouchPoints on hand in every classroom to use as needed. Over 24 million people are living with PTSD. They have had experienced traumatic events in their lives that they can’t get over. They experience immense stress, negative thoughts, hyperarousal, and can’t get past re-experiencing or reliving the traumatic event over and over again. TouchPoints can be used to help manage panic attacks, decrease or prevent angry outbursts, diminish unhealthy cravings, and improve their quality of sleep. Over 50 million people suffer from a sleep disorder. Do you, your child, or other family member have trouble falling asleep or waking up numerous times during the night? The quality of your sleep has A LOT to do with how productive your day is going to be. Using TouchPoints 15 minutes before falling asleep can help you fall asleep faster and stay asleep longer. You’ll notice the difference right away. If you’re one who stays up at night thinking about all the things that need to be done in the morning, TouchPoints will help you immensely. So Why Haven’t You Heard of TouchPoints? One of the founders of TouchPoints, Dr. Serin, used quantitative electroencephalogram data, existing neuroscientific research, and archival data to see the impact BLAST technology can do with just a few seconds of use. BLAST has been used in doctor offices for years, but after seeing the immense benefits, Dr. Serin teamed up with entrepreneur Vicki Mayo to bring this amazing technology to the masses in 2015. The TouchPoints company isn’t backed by a huge company with deep pockets. It’s a smaller company with a mission to reach families and adults who either can’t afford such treatments in a doctor’s office or most likely never knew this technology existed. Dr. Serin and Mayo’s mission is to make it affordable and available. TouchPoints Original is rechargeable and comes with an app for customization. At careful glance, you’ll see they are made of plastic; they do not look like a suped-up fitness watch or even possess the style and glamor of a Samsung or Apple watch. It’s not the cover of the book that possesses the beauty, but what is on the inside that counts. The TouchPoints BLAST technology can rock your world. Original has 6 settings to help with calm, sleep, focus, anger, performance, and cravings. In addition, TouchPoints Original comes with an app, offering additional customization. Basic, offered at a reduced price, has 3 settings to help with sleep, calm, and anger and does not need an app to begin working. 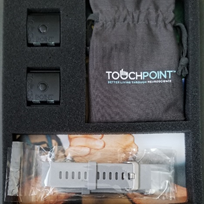 TouchPoints Basic kit for $160 or the Original kit for $260, pre-order them directly from the TouchPoints website. Wristbands are also offered in assorted colors, starting at $20. TouchPoints sent me a pair of the Stainless Steel Mesh wristbands (offered for $10 more) and I highly recommend them. They are magnetic and super easy to slide on and off. TouchPoints work through the use of Bi-Lateral Alternating Stimulation – Tactile (BLAST) which send alternating vibrations through your body to alter the Fight, Flight, or Freeze response to stress. With as little as 30 seconds, your homeostatic nervous system can return to normal, giving you clarity and a calmness not thought possible minutes before. Once you begin TouchPoints, you will hear them working…unfortunately, others can hear them too on your wrists. You also need to recharge them after every use. But they do work and can help with stress, focus, and performance. Believe it or not, one in three Americans suffer from extreme stress. TouchPoints can help with this. But you can benefit from TouchPoints even when not feeling stress. Use it daily for preventative measures to start your day more calmly, improve your focus and performance, and even reduce anger. Use them before bed to prepare yourself for sleep. Is your child anxious before a speech or test? Let him/her use them. Your husband has too much on his plate? Perhaps he needs to try them too. We were really excited to learn about TouchPoints and how they can remarkably change a state of mind within as little as 30 seconds. We can’t wait to hear your stories of how TouchPoints has changed your family life (or personal life) for the better! *This article first appeared in Well Connected Mom on April 6, 2018, by LORI CUNNINGHAM. To read the full article, click here. TouchPoints are a one of a kind, non-invasive way to help us train our brain to mitigate stressful situations. It uses patent-pending BLAST (Bi-Lateral Alternating Stimulation Tactile) technology to deliver gentle, haptic micro vibration patterns to stimulate Neuronal Pathways. This shifts the user out of the sympathetic nervous system and into the parasympathetic mode, which enables calm nervous system functioning. Over the past decade, Co-Founder of The TouchPoint Solution, neuropsychologist Dr. Amy Serin studied neuro-therapy specifically with QEEG, trying to find a solution for PTSD. As a result of her research, we got TouchPoints, a well packaged well designed, ready to use out of the box device. All you have to do is download the TouchPoint app (available on iOS and Android), pair the device and start the process. One thing that we found a bit confusing (yet well thought) were the clips versus the wrist straps. We didn’t know which to use at first, but after the first use you get yourself acquainted and you’ll be able to use the TouchPoints in different situations. 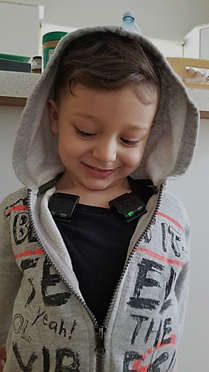 While working or running you can have it on the wrist strap, and when giving a presentation or when with kids you can have it clipped onto your pockets or belt loops. The difference in both mounts has no effect on the stimulation itself. After you launch the application, a good questionnaire was put in place for baseline and mental profile creation. It is composed of simple questions that collect and give information related to general stress and ways to cope with this stress identified by six profile types (scattered, overwhelmed, wired, hot, veiled and craver). After the questionnaire, users are encouraged to take a quick challenge by thinking about a stressful situation and how that affects your body (i.e. stomach butterflies and tightness in the chest). After rating your stress on a scale of 1 to 10 before using TouchPoints, you then put them on for 15 minutes and watch your stress melt away! Kind of like a training zapper that obliges your brain to shift its attention. After few days of training, you will discover where and how to best use your TouchPoints. Personally, I identified stressful situations in a context where I have to avoid fear — like stage fear or before an exam. I face this type of stress when I have a public talk or a conference to give, and I felt TouchPoints helped me eliminate the stress in my brain. Other areas they cover include General Stress, ADHD, Autism, Sleeplessness, and PTSD. I didn’t have the time to try them all yet, but I did try it on my kid, and to be honest, I was impressed to watch him change from an agitated situation to calm in minutes. This could be due to the use of a new tool or the tickling sensation he gets from the device. So, I decided to do the exercise on a daily basis with him and put the TouchPoints on every day when he gets home from daycare. After the second day he started asking for them, but still, I wasn’t convinced about the effect it was creating and how it was actually working. I had to do some extra testing and I decided to hook myself up with the NeuroServo hat, a device that shows the Focus and Perturbation levels using a light pattern on the hat itself. You can read more about Neuroservo via our Medium Article, but generally, it is Red light for Focus and Blue light for perturbation. During the first test with EEG Neuroservo, the Focus function made the light go red in a matter of minutes. The most important aspect here is not to bring the light to Red using the TouchPoints, it is more of adapting your brain to shifting attention. Several exercises exist in research to help you do so, and for me now TouchPoints is one easy solution but I can not confirm it yet. We need additional user research to be conducted with proper protocols to determine whether it’s the vibration effect that is making your brain shift its attention or it is really Neural Pathways that are being shifted and modulated. None of the links is an affiliate link, and all the information provided in this article is for general information and review purposes only and is the expressed opinion of myself, Ferdinand Ephrem and not the Publication. This includes (but is not limited to) my membership organizations and the product manufacturers. *This article first appeared on NeuroTechX's Medium Blog on April 6, 2018, by Ferdinand Ephrem. To read the full article, click here. The TouchPoints are twin vibrating devices that are worn on each wrist and use "Bi-Lateral Alternating Stimulation Tactile" technology to reduce stress. Click here to view this innovative technology on The Download for 12News Long Island TV. *This video first appeared on 12 News Long Island on April 6, 2018, by the producers of 12 News Long Island. To watch the full video, click here.